In the last two posts we talked a lot about career advice and how to always be professional. Don’t worry, I’m not going to rant about email this time — I’m going to rant about invoicing instead! As an independent contractor, you will invoice your clients. If you work semi-regularly at an event venue you may be asked to submit a W-9, but you can still request to take care of your own invoicing, thereby avoiding automatic tax withholding by the client. Whether or not this route is right for you is another discussion, but I will say this: your income will always be taxed, and it can be nice to have someone else take care of that. 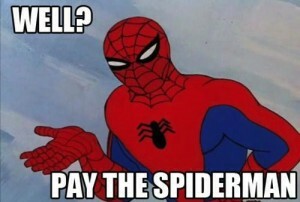 The rest of the time, you’ll need invoices. If you just need to send a couple of invoices per year, don’t waste your time becoming an office ninja. Just send an email with all of the pertinent details. It was great working with you on the Awesome Event yesterday. This email will serve as my invoice and I have attached a few photos of the event that you can use on your website. Moving beyond the casual invoicing, it is great to add features like online payment and automatic tracking. This will get you paid faster and help you keep track of payment status. Two of my favorite free options for this are PayPal and Square. As pro audio freelancers we don’t have a million line items or shipping to worry about, so our needs are minimal. It will take a few minutes to get setup the first time, but will be faster in the future, especially if you are invoicing a client you’ve already worked with before. Sometimes companies will have an internal code for the event that you should reference on the invoice. This is called a PO number. Ask about this if you want to look like a pro. Basically, you want to make it as easy as possible for their bookkeeper to quickly verify the accuracy of your invoice and get you paid. You may also need to include line items for any rental equipment you brought. I don’t have a lot of equipment so I use general descriptions like MacBook Pro and Drum Mic Package. How much should you rent your personal equipment for? It varies 8-15% depending on the lifetime value, maintenance costs, and how fast you need to recoup your investment. For example, projectors are expensive to rent because they require regular maintenance and have limited bulb life. On the other hand, cable covers and similar low-upkeep hardware should be cheaper. You may want to rent your mix console for cheap as part of a package with your service as a sound engineer to limit unknown variables and help you perform your best. If you don’t know, go with 10%. Completing the invoice is pretty straightforward once you have your client information and products. Sometimes I’ll add a discount when I’m renting out my own equipment for multiple days, like when I was on tour. What are terms? This is where you get to set the maximum number of days allowed for payment, and where you may include a discount for early payment or an interest charge for late payments. Generally, it’s best to get paid as fast as possible. 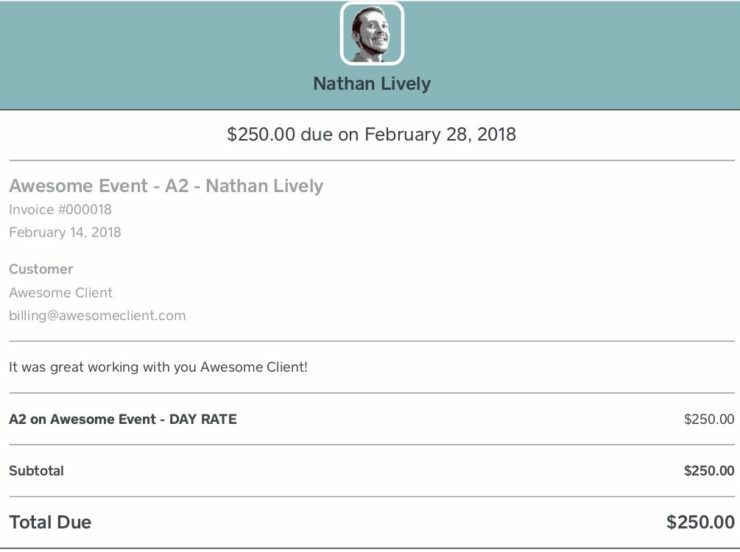 Most of the time people will deal with your invoice after money for the event has come in or at the end of the month when they pay everyone else. I use a standard term of 14 days, and I’ve never charged interest for late payments. Here’s what an invoice from Square looks like. I have switched invoicing providers over the years from email to Filemaker Pro to PayPal to Square to AndCo. Don’t worry too much about starting over. I haven’t had any problem with duplicate invoice numbers to different clients in different years. Get your profile set up at Square or PayPal. Download the mobile app so you quickly invoice remotely. Input client and product/service information (remember to use an easy taxonomy). Format the print layout to be as simple and professional as possible. Is there an easier way? What invoicing software are you using?